The iconic anchor of The O'Reilly Factor recounts one of the most dramatic stories in American history-how one gunshot changed the country forever. In the spring of 1865, the bloody saga of America's Civil War finally comes to an end after a series of increasingly harrowing battles. President Abraham Lincoln's generous terms for Robert E. Lee's surrender are devised to fulfill Lincoln's dream of healing a divided nation, with the former Confederates allowed to reintegrate into American society. But one man and his band of murderous accomplices, perhaps reaching into the highest ranks of the U.S. government, are not appeased. In the midst of the patriotic celebrations in Washington D.C., John Wilkes Booth-charismatic ladies' man and impenitent racist-murders Abraham Lincoln at Ford's Theatre. A furious manhunt ensues and Booth immediately becomes the country's most wanted fugitive. Lafayette C. Baker, a smart but shifty New York detective and former Union spy, unravels the string of clues leading to Booth, while federal forces track his accomplices. The thrilling chase ends in a fiery shootout and a series of court-ordered executions-including that of the first woman ever executed by the U.S. government, Mary Surratt. Featuring some of history's most remarkable figures, vivid detail, and page-turning action, Killing Lincoln is history that reads like a thriller. Absolutely Awesome. A must listen/read for all. Bill O'Reilly not only knows how to make a book exciting, his narration brings you to the moment making you feel like you are really there. If only my history teachers could have made my classes this interesting. Interesting read regarding some little known Civil War battles, Lincoln's last days, and the thoughts behind the assassin. Not impressed with O'Reilly's narration - barely average. A really good book. Nicely written and narrated. Worth buying, reading and suggesting. Riveting insight into the cause and assassination of our 16th president. Bill O' Riley is masterful in his captivating narrative. Well done! It was a very good book, filled with a lot of facts and information I did not know about leading up to Lincolns assassination. This is the second audiobook I've listened to and got us through 16 hour drive to and from destination. Very good listening. A great read! As a Canadian, I learned a lot about the assassination of Lincoln. The details on the events and how they are presented were fantastic. 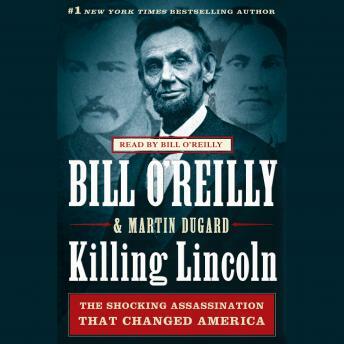 Bill O'Reilly is a great narrator and historian! One of the finest books I've ever read or listened to. I'm a physician and read serious material constantly. Because of this, when I have time for recreational reading, it is never non-fiction. But this book based on fact enthralled me from Kansas City, MO. until it finished before I got home in Arizona.